I was paging through the 100 years of UND basketball publication and tried to find where UND used a logo in the past. I have pictures of my dad in the 1950's having "Sioux" on his jersey. In the 70's Sioux was either on the jerseys or on the side of the shorts. The interlocking ND was used on the side of the shorts when Sioux was on the jersey. I didn't see the use of a Sioux logo last century in basketball. I do remember seeing the Brien Sioux logo on the shorts in BB. 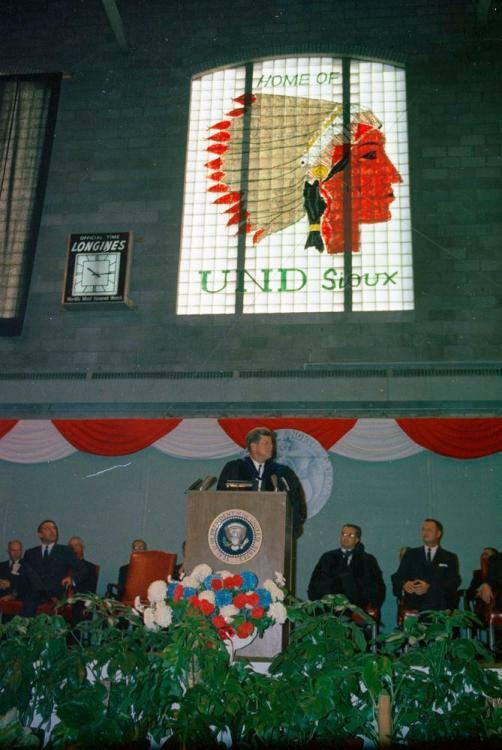 I also recall seeing a large mural type Sioux in one of the windows on the east wall of the Fieldhouse when I was a kid. I don't recall football using a Sioux logo. It was always the interlocking ND. In hockey the geometric Sioux logo was the first I remember of the Sioux logo. I looked back and see that there was use of another Sioux logo in the 1950's, before my time and there was the Sammy Sioux logo of the 1960's, which is a vague memory. Was that on the uniforms? Just trying to get some perspective on this issue. It seems BB and football rarely used the logo, just the name. Hockey has almost always used a logo. As a result, hockey fans have more angst than others. From those who can remember, was there a lot of dissent when UND went to the geometric logo. Heck, I don't even remember if going from the geometric to the Brien logo created a lot of turmoil. Was there? The first day the new Fighting Hawks logo came out, I just shook my head. Two days later, it looked a little better. I just think it takes time and adjustment. 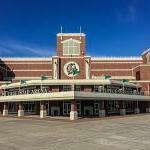 I remember several years ago some college friends of mine were in town for their kids graduation from UND. It was the first time they had seen the Brien logo. They had a preference for the old Blackhawks emblem. That's just what they were familiar with. They were much more disappointed in the loss of the name. Yes, and it looks even a little better today. It starts to grow on people. It just looked so bla at the beginning, maybe because the Brien logo had so much art in it? It will take quite a while before the name and logo really grows. I always said 5 to 10 years from now we will be in a better place with the name/logo among fans than we are now. More so with the logo than name since so much went into picking the name with the voting, compared to the logo which was designed by an outside company and voted on only by Ed Schafer himself. Its hard to let go of something you loved for so long, that anything compared to that logo looked bla. I used to be on the same team in a pool league with Ben Brien. He put a lot of work into making that logo. 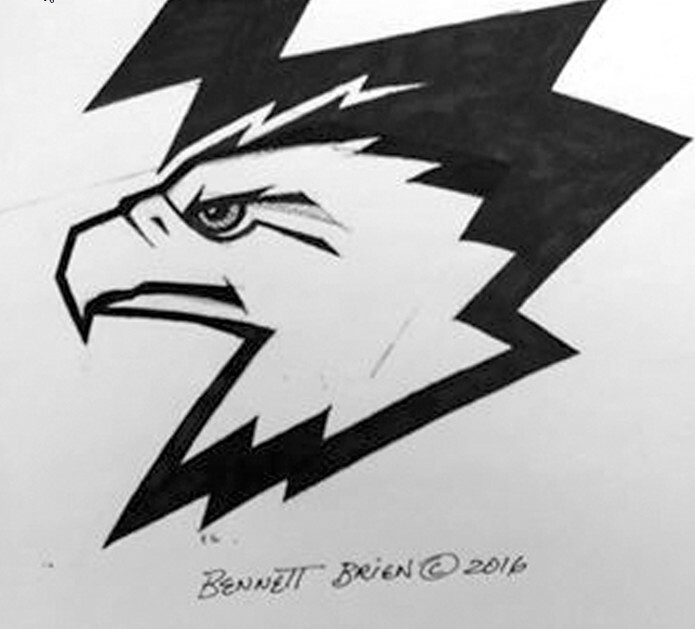 Ben Brien is very talented and could have made a great Hawk logo for probably less money they spent some outside company to do that. Out of all the Sioux logos ever made that was the best. Even better than the Blackhawk logo that dawned our hockey jerseys and other sports jerseys. As for Bisonville, I would never signup for that hellhole. I got out of AGS when that turned out to be Bisonville 2.0. The football team used Brien's logo directly under the V of the neck. It was very small and hard to notice though. Looks like he has a broken nose. Thanks for the advice! Go MBB tonight. I think the best part of this sketch is the Hawk's eye. It's got that same intensity as Brien's Sioux head. Sorry, by the way I was at that game that your Avatar is from, we should of won that one! Hot goalies win championships, especially in single eliminatation formats. Those two teams play each other 9 more times UND wins all 9. Ben mailed it in on that hawk attempt. Maybe....still better than our Postal Service logo though. So are you saying SME mailed it in as well? It will take quite a while before the name and logo really grows. Watching the women's BB game last night on Midco, and you could hear "Let's Go Hawks" chants from the crowd. The chants kinda took me off guard. At football, the new logo was much more accepted/prominent, but there were never really any "LGH" chants... at least none that I remember. I didn't notice any but they did add the screeching hawk noise after touchdowns. It's getting more and more common in those sports. Sammy Sioux was on one shoulder of the 59 jersey, along with block letters SIOUX diagonally across the front of the jersey, my all time favorite jersey. There was also another Indian head jersey from the 50s and then of course the Blackhawk jerseys. Anyone remember this Logo, used to hang on the east wall inside the Field-house. This picture was taken at the time President John F. Kennedy was here. Notice Home of UND Sioux, no fighting in the wordage. I've talked this over with many alumni over the years and we don't remember the word Fighting to have been used with Sioux when we went to UND. Was hanging at least into the early to mid 70's. I also remember that clock. Pretty large, maybe this was a gift to UND? This pic is at the time President Kennedy was here. Notice Home of the UND Sioux, no fighting in the wordage. I've talked this over with many alumni over the years and we don't remember the word Fighting to have been used with Sioux when we went to UND. Hand up for thinking of the wrong "President Kennedy."